or Chana Masala, if you prefer. Very popular across the world, this Punjabi dish is one of my favourite curries. 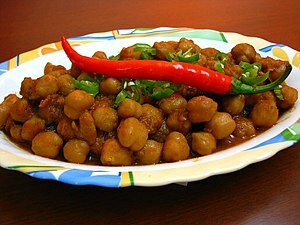 I’ll often choose this dish as a baseline test when I try new restaurants and takeaways – although this is a relatively simple dish, Chana Masala can be over complicated or ruined with inappropriate spice blends. I’ve cooked many variations over the years, but this is definitely one of the est to date. The Chana Masala Powder I use is quite hot, so I don’t add the green chillies. Feel free to throw a couple of extras in i you need the chilli kick!